The Evil DM: This is how I roll! : The Evil GM - Character with Baby, Follow up. 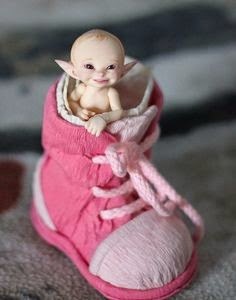 Following up on my post from last week, when one of my players asked about a concept of her character having a baby while adventuring, The Evil GM - Adventurer with... baby?! The group got together, and we all talked about it, and everyone seemed to agree with playing along. One player even stepped up and decided on going with a Paladin to make sure "nothing happens to the baby". He also decided that their back story was they met along the way and the Paladin out of the kindness of his heart, started helping her and protecting her.. not THINKING there was anything wrong. The back story on her snatching the baby, was that the mother and father died while out in the field doing work. How she got the baby was she was traveling out of town, and heard the baby crying, and went to investigate. When she came upon the house she found the parents dead, the house ransacked and a crying baby nestled in blankets in a crib. She, with out thought, took the baby and ran, not seeing if anyone else was alive or if she had local family. Does this fall under "evil intentions" or "motherly nurturing"? Maybe a little of both, as she decided on Chaotic Good for her alignment. Here is a twist I decided to add, her character was not aware of the older (but not enough to defend) brother who was hiding in the closet peering out. So.. I could set this up for a whole brother on her tail, seeking out revenge, as maybe he thinks this character slaughtered his parents and stole his baby sister.